I hope y'all had a Happy Halloween! I have no idea how I can top this with Kid #3 in tow in 2014. Any ideas? I used this photo as a guide. 1. Start by cutting the bottom off the box and all the inside flaps. Save them all to use later. 2. Using the short inside box flaps and the extra piece of cardboard, use the marker and box cutter to cut out two sides and front and top for the rocket's nose piece. Angle them together and use a crap ton of masking tape to make them stick together. 3. Using the bottom of the box, use the marker and box cutter to cut out two wings that are the same length of the rocket's body. Use the masking tape to reattach them to the bottom of the box. Optional: if you want them to stay in the out position, cut two long strips of cardboard and attach them to the underside, wing to wing, with duct tape. 4. Using the oatmeal box or rolled up poster board, use masking tape to attach the curved engine housing on the back top of the rocket. 5. Using cardboard scraps, cut a top fin to go between the engine housing. Attach with masking tape. 6. Cut a hole in the top of the box where your kid's body will go. Make it further back than I did since the back will be heavier than the front. 7. Cover the back of the rocket with black cardstock. Cover the rest of the rocket with white duct tape. Don't worry if it's messy. Use the skinny black tape to make trim, a windshield, and a black bumper. Use the box cutter to trim up excess tape. 8. Decorate! 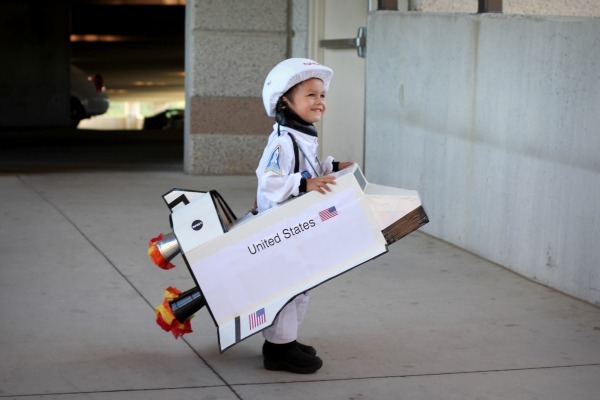 Print out flags, "United States", and NASA logos and glue them to the rocket. Glue the cups to the back and stuff them with (glued in) tissue paper. 9. 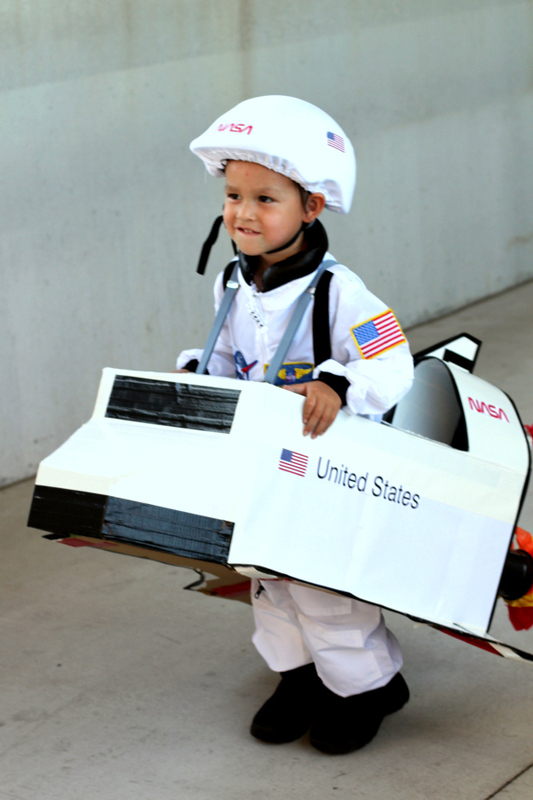 Put your kid inside the rocket hole and attach the suspenders to the box. Adjust accordingly. White cardstock for printables, including Cabbage Patch Kids logo, flowers, and miscellaneous doll box info (made in Photoshop). 1. 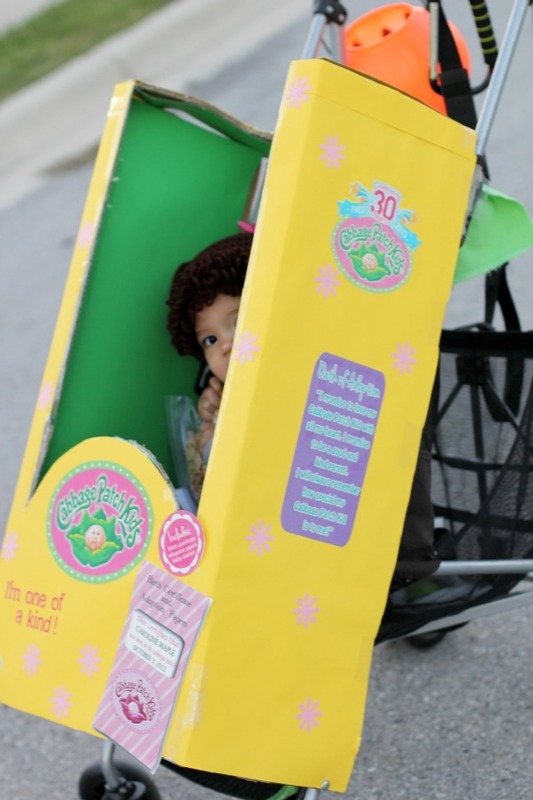 Start by making sure the box is as deep and wide as the stroller (or slightly larger). If so, leave the top flaps intact but deconstruct the bottom flaps (so your kid's feet can hang out the bottom of the box if need be). Cut the back off the box completely. 2. Using the marker and box cutter draw and cut out the curved window part from the top and front of the box. 2. Line the inside sides with green poster board and line the entire outside with yellow. 3. Using a ton of packing tape, attach the box to the stroller. 4. 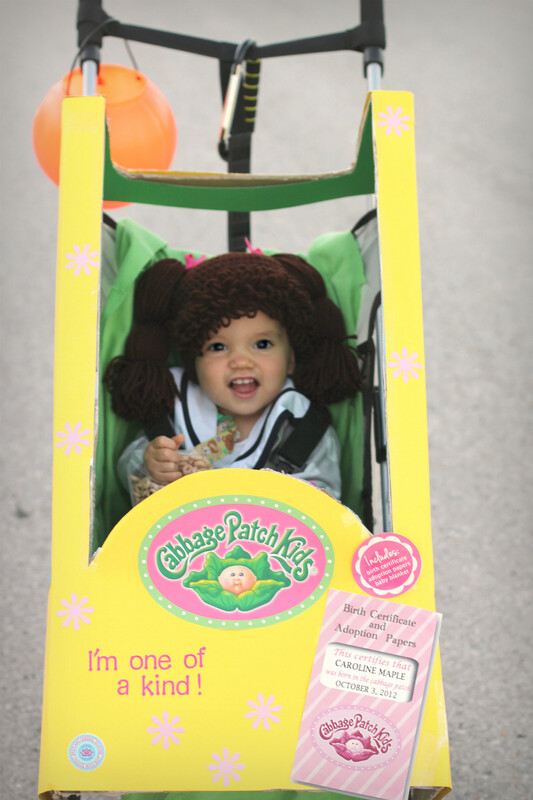 Lay the green fabric on top of the stroller seat, and cut out slits for the stroller seat belts. Safety pin the fabric via the back of the seat's top so you don't have to worry about it slipping down once your kid is in position. 5. Decorate! Print out the logo, flowers, and doll info for the box. Don't forget the outside sides since often, that's what people will see first! 6. Put your dressed up kid in the stroller. Tip: give her a special toy or a baggie of food so she doesn't grab the box and tear it up. I learned this the hard way and had to do repairs after Chris' work party.